A sworn translation must bear the translator’s official stamp. Sworn translations are done by trusted translators to ensure that the authorities needing the document in their language are able to fully understand the contents with certainty. Sworn translators that are certified by the High Court and are listed in the register of certified translators and interpreters. What does it mean to have documents translated for legalisation? Various authorities outside of South Africa require official documents to be translated before they can be legalised. Translations ensure that authorities outside of the Republic are able to fully read and comprehend understand the document’s contents. Documents that have been legalised through means of apostille or certificates of authenticity may need to be translated. You don’t have to get a document translated in the case where it has been originally drawn up in English, German, or French, but all other languages need to be translated by a sworn translator. Translations thus always follow the process of apostille, which includes the translation of the apostille stamps. A sworn translation is stamped by the translator with a stamp that they earn as part of their job, with permission issued by the High Court. Without the stamp (and often a public reference to their status on the register), the translated document will not count for what you need it for. 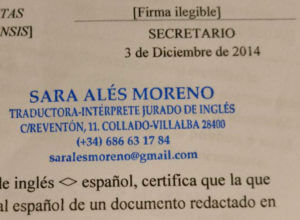 Why do official documents need to be translated? It’s not always clear to understand the legal requirements for documents that are to be used abroad, and something you might have encountered before is the term Sworn Translations. In the information contained on this page, we will be taking a closer look at what Sworn Translations are, why they are needed, and how to go about the process, which should all help you with the legalisation of your official South African documents for use abroad. A sworn translation has to be done by translators that are certified by the High Court and are listed in the register of certified translators and interpreters, otherwise anyone could translate both incorrectly and with malintent. If it is not possible to have the translation done in South Africa, which is very rare, you can also have the document translated by a sworn translator abroad, although you will have to get both the original document and the translation legalised or issued with an apostille. If your document has been translated by a registered sworn translator, you can have it legalised for use abroad. What are the requirements for translations of a document? What documents have to be translated? In most cases, you can have a document notarised by a Notary Public as long as the document’s notarial wording has been written in English and has been notarised in accordance with state law. 1. Firstly, you will need to have your documents verified by a Public Notary or translated by a Sworn Translator of your choice. 2. Translated documents must then be taken to the Registrar of the High Court of South Africa in the same jurisdiction as the Public Notary / Sworn Translator. The Registrar will then verify the signature or the seal of the Sworn Translator after which documents have to be Apostilled (for countries that are signatories of the Apostille Convention) or Authenticated (for non-signatory countries). 3. After the High Court has authenticated the documents, they must then be submitted to the Legalisation Section of the Department of International Relations and Cooperation.